23 people found this useful. 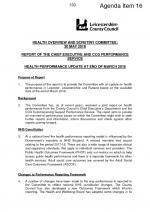 Leicestershire County Council - Health & Wellbeing Performance Report Q4 2017/18. The report and associated dashboard provide Leicestershire County Council's update on local health and wellbeing priorities. The report covers Better Care Fund performance (including care home admissions, delayed transfers of care, falls); hospital and clinical commissioning group (CCG) performance; East Midlands Ambulance Service performance and Health & Wellbeing Strategy progress.